The Garage48 Wood 2, that took place for the 2nd time, was again a makeathon that showed a really high level of prototyping power. 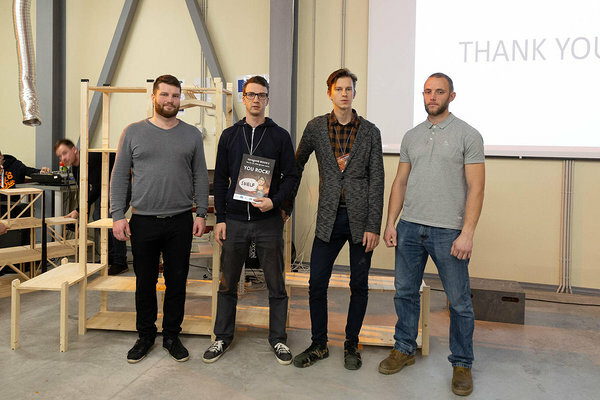 This past few sleepless nights and days, 12 interdisciplinary teams of woodworking, design and architecture students and practitioners built prototypes ranging from new solutions utilizing wood in the open space to levitating objects and dog houses. Maarika Truu, Head of Startup Estonia and a long-time Garage48 team member who was the head mentor and moderator of the event commented: "Garage48 Wood is different from what we usually do, but after the success of this and the last one, we see that there is a need for these kind of events. It's amazing to see all these physical products that the teams can be only with 48 hours. I would like to play with the idea of connecting other industries as well like forest, metal and construction for example. " To make these prototypes into a reality, the support of mentors is extremely important. A big thank you to all the mentors, who were ready to take the time durign a whole weekend and share their knowledge and skills: Moderator and head mentor Maarika Truu (Garage48, Startup Estonia), Jörgen Dobris (TSENTER), Martin Melioranski (Estonian Academy of Arts, Meliorad), Renee Puusepp (Estonian Academy of Arts, Creatomus), Aija Freimane (Art Academy of Latvia), Jaan Kers (TalTech), Maris Simanovics (wood engineering & bizdev), Nauris Grandans (MeKA), Marek Mardisoo (EstHus), Andre Visnapuu (UUP), Triin Kõivupuu (UUP). Our great friends and supporters from Garage48 Hardware & Arts hackathons - MassPortal team with Egils Arajs and Kriss Berzkalns spent the whole 48 hours printing 3D parts for the prototypes. Thank you so much again! 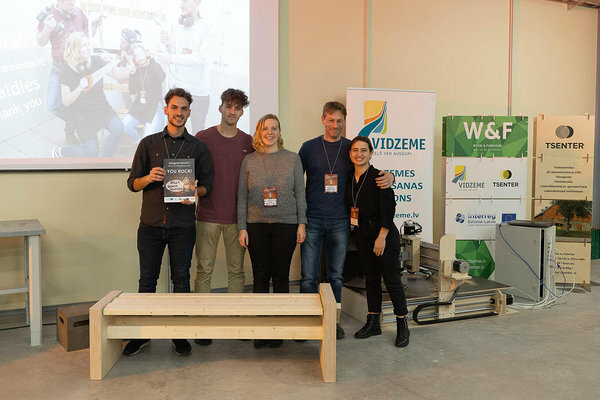 A big shoutout to the instructors of the Cesis School of Design and Technologies and TSENTER who helped the participants in operating with the power tools and woodworking machines - Tanel Velga (TSENTER), Martinš Jurcinš (Cesis School of Design and Technologies), Lauris Purinš (Cesis School of Design and Technologies), Andrejs Koklis (Cesis School of Design and Technologies). Special thanks to the organisers that made all of this happen: Lauri Semevsky (TSENTER), Laima Engere (Vidzeme Planning Region), Ieva Bivina (Vidzeme Planning Region), Kadri Kõivik (Garage48, Contriber), Jörgen Dobris (TSENTER), Gatis Teteris (Vidzeme Planning Region), Saskia Jõers (sTARTUp Day), Sandra Eowyn Karu (Photographer), Everiin Silas (volunteer), Sandra Verrevmägi (volunteer), Helen Eglit (volunteer). And now without further ado, let's see who were the specially smily faces - here are the winners of Garage48 Wood 2. Dacha is a prefabricated hybrid house with hustle free transport and assembly. Prize: Startup Estonia special prize, Wood Days passes and local goodie bags. 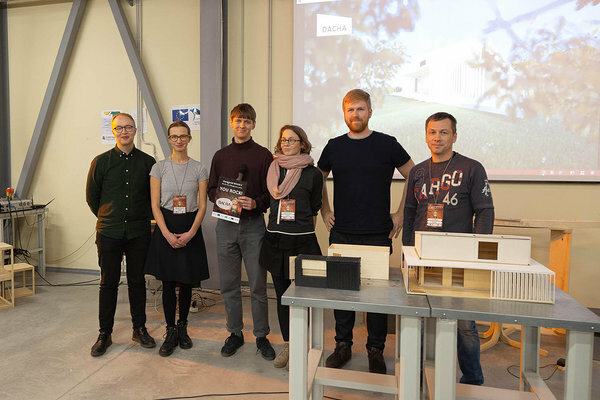 Team: Robert Männa (Manufacturer/Pitcher, EKA) Aivar Pehme (Manufacturer, TTK) Matis Velt (Team Lead, Q-House) Agate Eglite Drezina (Designer, Art Academy of Latvia) Marianna Zvereva (Designer, EKA) Vitali Valtanen (Designer, EKA). The winning team commented: "We will move one with the project, we didn't expect to win anything when we came in on Friday. It was really a great surprise, it was mostly our own interest that pushed us to do this project. It's amazing to get validation for your idea like this." Men needed Garage48 where to build their own CNC machine. Prize: Wood Days passes, local goody bags. Artūrs Vēveris (designer), Kārlis Vēveris (engineer), Oskars Janševskis (engineer), Mikus Purmalis (carperter). An innovative levitating bowl based on magnetic levitation. It flies in air and rotates. Impress your clients by having this in your restaurant, reception desk or office. Everybody who see this will be astounded. Team: Ingus Puķītis (author of idea/joiner), Lauri Mei (joiner/designer/engineer/pitcher), Mārtiņš Ciekurs (marketer/business developer), Pēteris Ciekurs (project manager). Making the best little houses for your dogs. Prize: Coworking desk in sTARTUp Hub and Prototyping time at SPARK Makerlab. Team: Ants Tiido (joiner, VKHK), Sirle Kont (marketing, SWA), Magnus Otsa (wizard, Haluvalgus OÜ), Sven Tiirusson (Industry wizard, Attel design OÜ), Verner Mättas (joiner), Oliver Kanniste (designer, EKA), Nameda Zemite (designer, LMA), Martin Varvas (team lead). Modular shelf with no screws, so you can add additional elements without reattaching. Team: Māris Bergs (designer), Roberts Rozītis (joiners/designer), Matīs Krauja (constuctor/engineer), Oskars Kreišmanis (constuctor/engineer). Tired of sitting on a wet bench? Waiting for the bus to come and you can't sit because the bench is wet from the rain? Well, Rain is no longer a pain! Team: Visar Hadri (Marketer/Business Developer, RTU), Gresa Morina (Architect, RTU). Elina Zarina (Designer, LMA. Andris Vanags, Joiner/ Technologist CTDV), Gundars Priedins (Company Practicioner, GPmetal). WoodDo bed is dedicated to serve children up to the age of 4 - 5. Each element of the bed is constructed in such a way that it gives creative freedom to both parents and the kids. Prize: RTU special prize, wood days passes, Wooch watch. 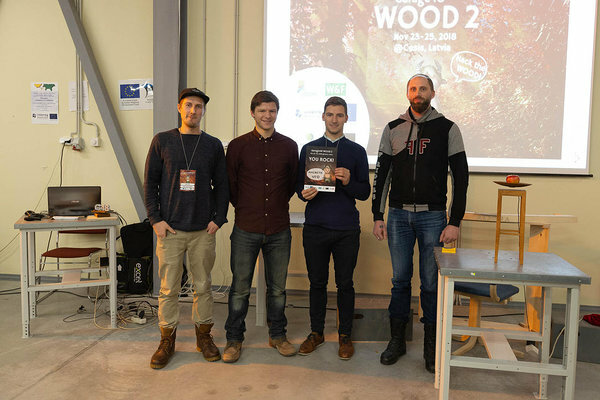 Team: Gaļina Asmaite (designer, LMA), Ēriks Kanaviņš (woodworker master in BPVV), Kaspars Aigars (business manager), Edvīns Sirmacis (woodworker, BPVV), Elmars Brants (woodworker, BPVV), Kristaps Ludvigs (woodworker, BPVV). 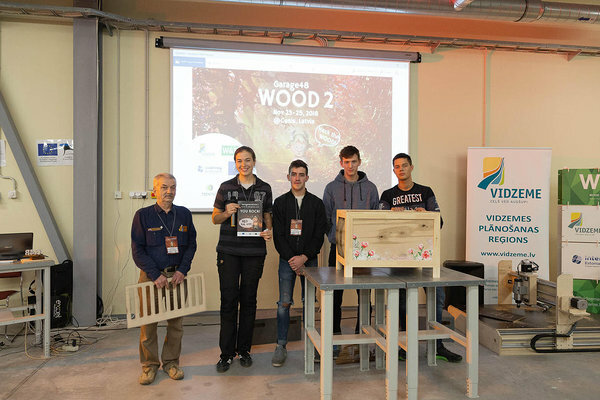 Let's remember once more, that all the participants, mentors and organizers are winners for taking the time for themselves to develop their skills, take on new challenges, make their ideas into reality, meet new people in and connected to the woodworking industry AND have lots of fun while doing it. YOU ROCK! See you at the next Garage48! 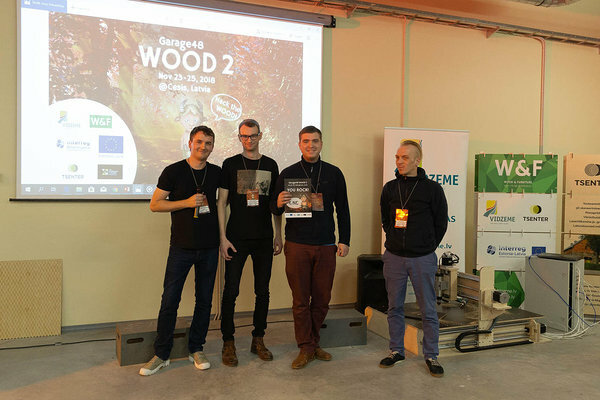 Garage48 Wood hackathon is a part of the Wood & Furniture project in the Interreg Estonia-Latvia programme. The project is financed by the European Regional Development Fund and co-financed by the Ministry of Finance and supported by Cesis School of Technologies and Design. 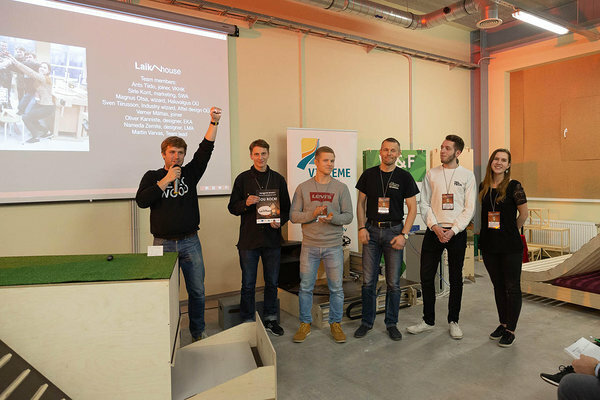 Our supporters are MadeBy, Art Academy of Latvia, Lift99.co, SPARK HUB, Skola6, MassPortal, Võrumaa Kutsehariduskeskus and Riga Technical University. This webpage reflects the views of the author. The managing authority of the programme is not liable for how this information may be used.